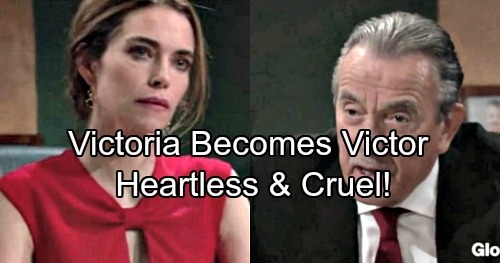 The Young and the Restless spoilers tease that Victoria (Amelia Heinle) appears to be ready to wage war, rather than move forward since she’s become Newman Enterprises’ Chief Operating Officer. One would expect Miss Newman to be happy, considering that her company was just saved from almost certain doom. Working under Victor Newman (Eric Braeden) would be bad enough for anyone, but also being his first-born makes it infinitely harder, if not impossible. Vickie’s first decision involved her attempting to blame Abby (Melissa Ordway) for the Design Date disaster. She wanted to issue a public statement that separated the company from her own sister as a form of damage control. Thankfully, Neil (Kristoff St. John) stood as the voice of reason and as Newman’s third party Public Relations source. To think that Abby has been locked in a storage unit and can’t get out while Vickie just had her backstory saved by daddy is incredible. Vickie’s childish response to Abby’s disappearance is a personality reverse. In days gone by Abby would have been the one behaving badly. Then, Lily (Christel Khalil) arrived for work. Despite Newman Enterprises’ immensely deep pockets, Vickie felt compelled to slash Lily’s salary and benefits. Her seemingly sole surviving Brash and Sassy employee had her role reduced and learned, when reading an employment contract, that she actually was a new hire. Yes, Vickie had dusted off her bachelor of science degree in corporate speak. The company Vickie bought outright from Jill (Jess Walton), at Victor’s urging, was badly run. That’s why Hamilton-Winters was recently tapped for a bridge loan. When that cash infusion proved inadequate, Vickie agreed to take the original Newman division back to its home. Billy (Jason Thompson) had previously been tossed overboard. Vickie learned that his efforts to rush the facial mask to market created the toxic outcome. That news went viral within the business world, thus causing Brash and Sassy’s peril. Oh, Vickie also slapped Billy across the face after he’d just rescued three people from a burning building and nearly died. It’s clear that Vickie is frazzled. She’s still recovering from poisoning, due to the aforementioned masks. Her pressured decision to be taken over by Newman also almost certainly means that the past will repeat itself. Vickie and Victor share similar personality traits and can never get along for long. Vickie has attempted to protect herself this time by having a strict contract drawn. Victor signed it before she agreed to what was called a merger. But old-school thoughts surely are swimming in Vickie’s mind, as she worries about Victor’s controlling nature and her longevity in the family fold. Do You Like Victoria Becoming Heartless & Cruel?